Today on the Senate floor, Pat Toomey (R - Penn) announced the bombings at the Boston Marathon. 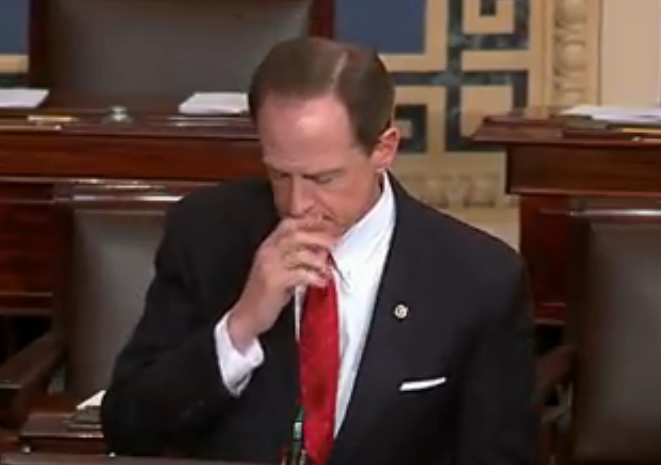 At the beginning of the video above, Senator Toomey says, "I would like to begin by ah, actually taking a moment to ah, inform the members of this body ah people who maybe listening, if you weren't aware, ah it appears that a tragedy has struck at the Boston Marathon ..."
At the 0:02 second mark Senator Toomey rubs his nose with his right hand just after he says, "I would like to begin by ah ..." Of course very few people would ever "like to" make such an announcement - particularly in such a setting. However leaders must lead and free societies this does not include keeping people uninformed. So strictly speaking, although he was by no means lying in the classic sense, when he said, "I would like to begin ...", this was false. He would have much rather the tragedy not have taken place. He is emotionally processing the event. So this is an interesting example of a form of a lie - a manner of speech, when no deception was intended. Yet the nonverbal display of the nose touch/rub signals us that in fact a falsehood was uttered. Ironically in this context - this "white lie" is a display of sincerity. Senator Toomey's two jacket adjustments (during 0:05 - 0:06) in body language nomenclature are known as "Self Preening". In this cluster context they indicate a relative lack of comfort. Pat Toomey displays a right cheek touch at 0:17 - another significant anxiety tell. Throughout this entire short video, one or both of Pat Toomey's hands are in his front pants pockets. This nonverbal signals low comfort and withdrawal. When a person is configured in this manner during speaking - it tells us he would rather not be talking. Most everyone would feel similarly in his shoes. In addition, throughout much of this video the Senator's central forehead is contracted (CFC). When the central forehead muscles contract (with the peripheral forehead relaxed) with simultaneous painful, sad (as Toomey does) or fearful mouth expressions - this indicates pain. Such pain is either emotional or physical and being experienced directly or felt secondarily via empathy. People who display such clusters have high empathy quotients. Pat Toomey is feeling sincere empathy for the victims. Interestingly and a very valuable tell (not seen here) are those who display the CFC in the context of a smile (even a subtle one). We all do this occasionally, however when such nonverbal behavior is observed often - it is a huge red flag. Stay away from those who use the "CFC + smile" body language chronically - they are not to be trusted. My condolences to the victim's and their loved-ones. Nonverbal Communication Analysis # 2074: Mitt Romney and Senator Kelly Ayotte What Body Language Tells?